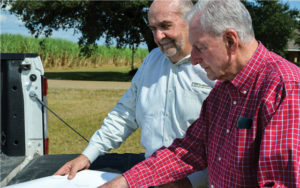 Port Executive Director Craig Romero and Commission President Gene Jefferies reviews site for Caliche New Iberia, LLC. New companies… new jobs… and new infrastructure investment mean continued growth for the Port of Iberia. Executive Director Craig Romero is in the final stages of negotiating leases with three new companies to locate at the Port of Iberia. Caliche New Iberia, LLC, a Houston based company is in the process of signing a “Right of First Refusal” for 50 acres located on Pesson Road. According to Romero they will invest more than $130 million in infrastructure building including extending rail spurs into parts of the port and adding an additional slip. They will establish an intermodal loading and unloading facility as well as storage for natural gas liquids (NGL). David Branch, a spokesman for Caliche stated, “This area has great resources in terms of personnel and location. The labor pool is strong and the Port of Iberia is a great conduit to the rest of the country.” Much of their process is automated, however Branch estimates 20 long-term jobs will be created. Crosby Energy Services is in the final stage of negotiating their new lease for 15 acres along with a 35,000 square foot fabrication shop. Crosby will fabricate ASME-coded pressure vessels at the port then ship them to operations in the Gulf of Mexico, and West Texas as well as other oil and gas producing areas in the U.S. “This company will need skilled welders and we’ve got those around here,” stated Romero. Crosby could eventually have up to 70 employees.